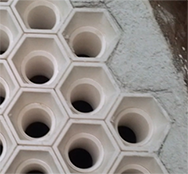 Blasch Precision Ceramics, Inc. announces that it has entered into an agreement with Christy Catalytics, appointing Christy as the exclusive worldwide distributor of their 99% Alumina ceramic precast boiler ferrules for the synthesis gas industry. Christy Catalytics, with principal offices in St. Louis, Missouri, is a manufacturer of industrial ceramic products to the global refining and chemical industries and supplies a full spectrum of reactor internals and peripherals, including many essentials for the synthesis gas industries. With sales in more than 40 countries, Christy’s network of agents covers much of the globe’s active refining and chemical processing geographies. Visit Christy Catalytics at www.christycatalytics.com for more information.